Data from NASA's Chandra X-ray Observatory have been used to discover 26 black hole candidates in the Milky Way's galactic neighbor, Andromeda, as described in our latest press release. This is the largest number of possible black holes found in a galaxy outside of our own. 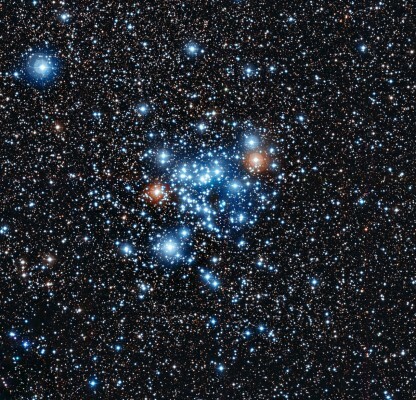 The star cluster NGC 3766. 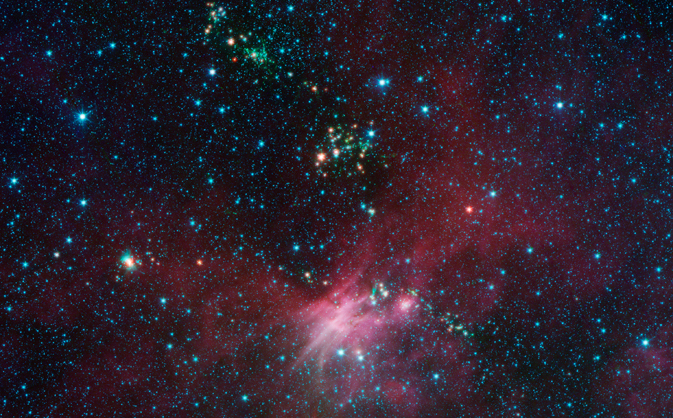 Image credit: ESO. Image credit: NASA/JPL-Caltech/Univ. of Arizona. 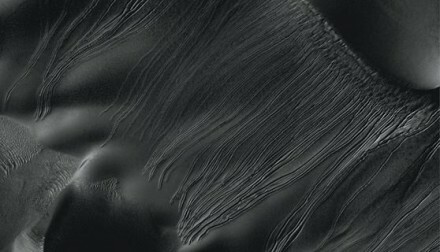 New research suggests that some of the famous gullies on Mars are caused by slabs of dry ice gliding down sand dunes on cushions of gas similar to miniature hovercraft. Image credits: ESA/XMM & R. Willatt. The face-on Pinwheel spiral galaxy is seen at ultraviolet wavelengths in this image taken by ESA’s XMM-Newton space telescope. Artist’s impression of the dust trap in the system Oph-IRS 48. Dozens of newborn stars sprouting jets from their dusty cocoons. Image credit: NASA/JPL-Caltech/University of Wisconsin. New views from NASA's Spitzer Space Telescope show blooming stars in our Milky Way galaxy's more barren territories, far from its crowded core. The images are part of the Galactic Legacy Infrared Mid-Plane Survey Extraordinaire (Glimpse 360) project, which is mapping the celestial topography of our galaxy. The map and a full, 360-degree view of the Milky Way plane will be available later this year. Anyone with a computer may view the Glimpse images and help catalog features. We live in a spiral collection of stars that is mostly flat, like a vinyl record, but it has a slight warp. Our solar system is located about two-thirds of the way out from the Milky Way's center, in the Orion Spur, an offshoot of the Perseus spiral arm. Spitzer's infrared observations are allowing researchers to map the shape of the galaxy and its warp with the most precision yet. A flash of light from a stellar outburst has provided a rare look at the 3-D structure of material ejected by an erupting nova. 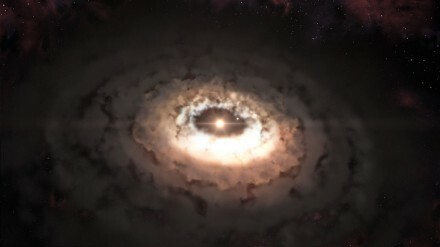 Astronomers used NASA's Hubble Space Telescope to observe the light emitted by the close double-star system T Pyxidis, or T Pyx, a recurring nova, during its latest outburst in April 2011. A nova erupts when a white dwarf, the burned-out core of a sun-like star, has siphoned off enough hydrogen from a companion star to trigger a thermonuclear runaway. As hydrogen builds up on the surface of the white dwarf, it becomes hotter and denser until it detonates like a colossal hydrogen bomb, leading to a 10,000-fold increase in brightness in a little more than one day. Nova explosions are extremely powerful, equal to a blast of one million billion tons of dynamite. T Pyx erupts every 12 to 50 years. Most detailed seurveys ever of the Large and Small Magellanic Clouds. 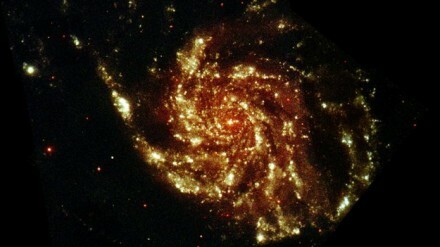 Visible image credit: Axel Mellinger, Central Michigan Univ. 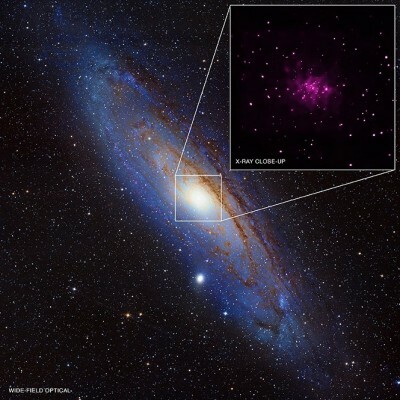 Astronomers at NASA and Pennsylvania State University have used NASA's Swift satellite to create the most detailed ultraviolet light surveys ever of the Large and Small Magellanic Clouds, the two closest major galaxies. 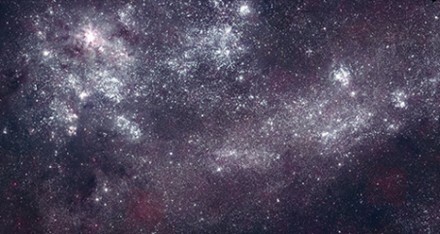 "We took thousands of images and assembled them into seamless portraits of the main body of each galaxy, resulting in the highest-resolution surveys of the Magellanic Clouds at ultraviolet wavelengths," said Stefan Immler, who proposed the program and led NASA's contribution from the agency's Goddard Space Flight Center in Greenbelt, Md. Immler presented a 160-megapixel mosaic image of the Large Magellanic Cloud (LMC) and a 57-megapixel mosaic image of the Small Magellanic Cloud (SMC) at the 222nd American Astronomical Society meeting in Indianapolis on Monday. Lightest Exoplanet Imaged So Far? 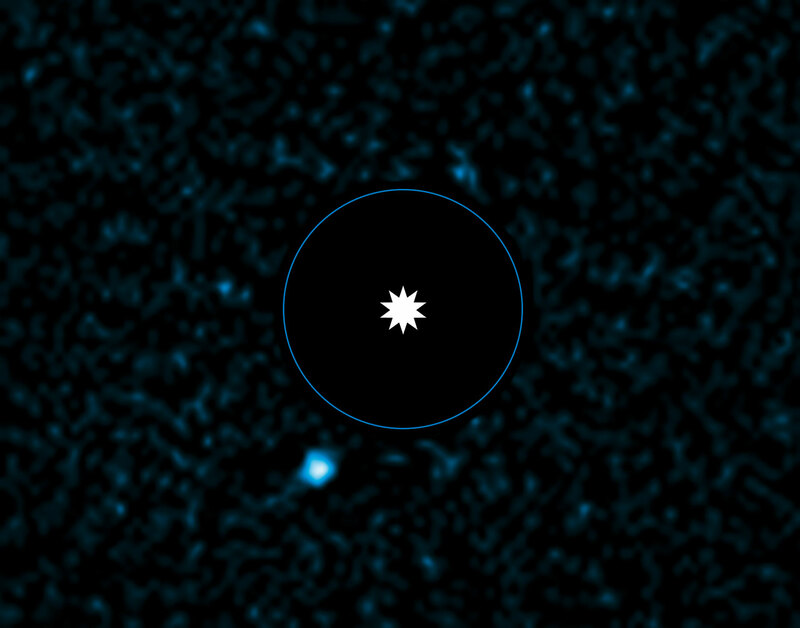 category: ESO, Extrasolar Planets, VLT Comments Off on Lightest Exoplanet Imaged So Far? 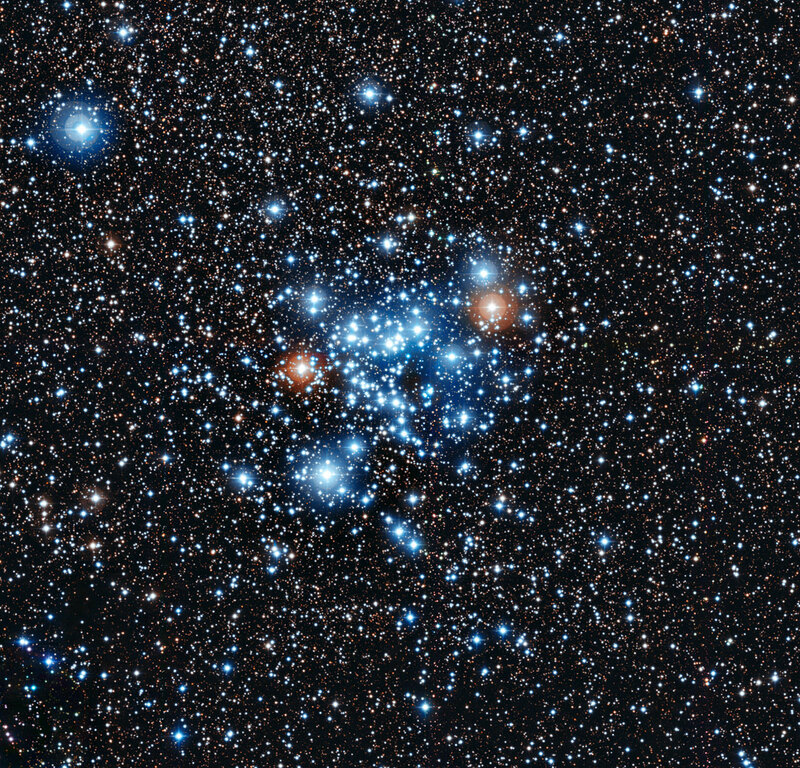 ESO's Very Large Telescope (VLT) shows the newly discovered planet HD95086 b. Here are some social pages as well as our Homepage and Wikipedia page. Any teacher who wishes to announce an event at his country (or school) is welcomed to send the news as he wants it to be presented. The text should be sent in Word (.doc) or text (.txt) format and images in JPEG or GIF format. If you are an astronomy teacher and want to be part of our news team (Contributors), all you need to do is to contact your EAAE national representative and request him to send us your email contact to confirm you are in fact a teacher. You can subscribe to receive an EAAE News daily digest in your email by clicking EAAE's Feedburner page.